Walter J. Phillips's watercolours are executed with an assuredness of hand in the medium that is unmatched in Canada. Belied by its apparently simplicity, watercolour is the least forgiving of all the artist's painting media. Once the paint is on the paper, there is no opportunity to cover it up, remove it, or work it into another position without evidence of these changes showing. Accordingly, Phillips had to know exactly how far paint would run, where he wanted bleeds, where he wanted the edge of the flow to come to a stop. He had to predetermine the fully finished work in his mind's eye before his brush ever touched the paper. 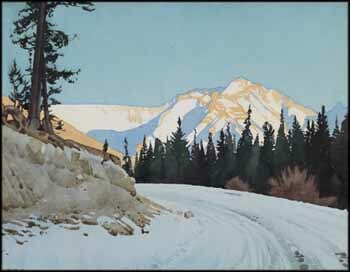 In looking at Road Up Tunnel Mountain, with its large portions of bare white paper, ever-so-subtle variations of light on snow, and beautifully rendered shadows on the mountains, we are acutely aware of Phillips's skill as a watercolourist, as he has depicted the ridge lines of Mount Peechee - one of the peaks of the Fairholme Range in the Rocky Mountains - with absolute accuracy.